I reached a point in my life where enough was enough, and I needed answers. I knew I couldn't live another day doing things I absolutely hated for money; I hated how much control it had over me. It led me to quitting my stable job and a complete collapse of my reality took place while I figured out exactly how to get the hang of this thing called abundance, or wealth. 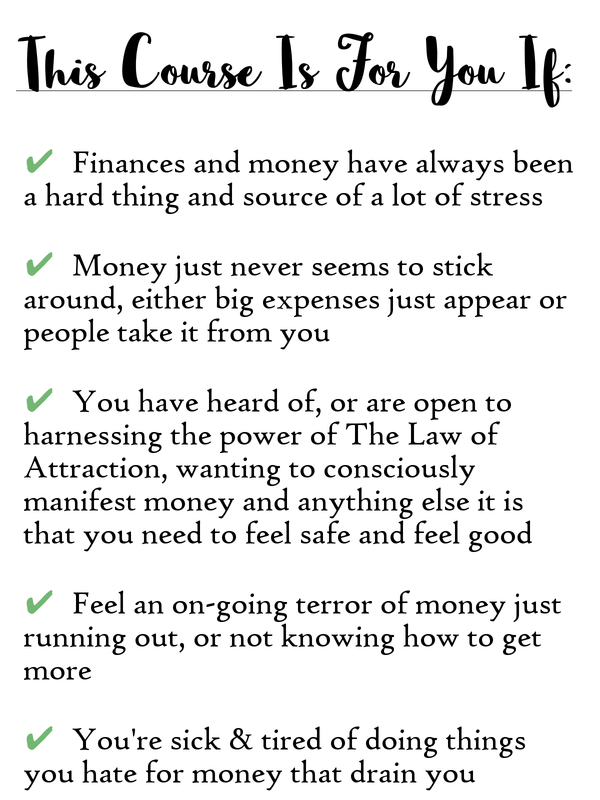 I was previously aware of that thing called The Law of Attraction, but I hadn't exactly figured out how to practically apply it in my life. I was trying to soak in as much information as I could on how I could manifest the life of my dreams and how to have enough money without being stressed all the time and not knowing whether I would find myself in another hole that I would have to dig myself out of. It took me hitting SEVERAL rock bottoms before I mustered up the courage to just put myself out on a limb and experiment with this stuff, because at that point, what did I really have to lose? Could I possibly become even more miserable? So I decided to find a way to organize all of this information I had been learning over the years into something more structured that made sense for me, and that I could actually see myself doing. Before I knew it, I immediately began to see some changes. The first OMG moment for me was when I was accepted to a training held by Teal Swan to be certified in the Completion Process, which is an emotional healing service that I now offer. I had to come up with travel and tuition money super fast, so I was presented with an opportunity in that moment. Let me put this to the test and see if it actually works! And holy crap...it DID. I raised the full $2600 that I needed by virtue of donations and help of the universe in a WEEK! AAHHH. Then I KNEW there was something to this, that I was on to something. I was able to continue practicing this process I'd developed and was able to successfully finance and move across the country to Portland Oregon, where I LOVE so much, WITHOUT A "REAL JOB," with a beautiful conscious community in my favorite area of the city, in a sustainable way, all because of the mindset shifts I decided to make, and by following this process. Because I got to witness first-hand how LIFE-CHANGING this was, I began to have the thought: So what if everyone knew about this? What kind of different world would we be living in if people were empowered to have their needs met, and it could even be easy and fun?? That life doesn't HAVE to be hard. That MONEY doesn't HAVE to be hard! So then, this course was born!! I decided that I am going to teach this, and it is going to change lives. 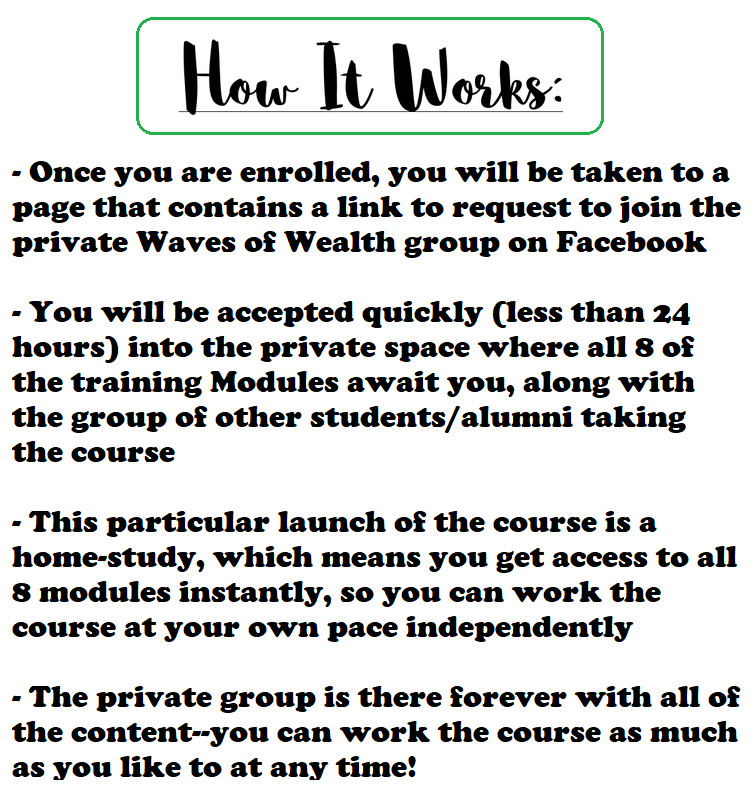 Welcome to the 3rd Launch of Waves of Wealth: Home-Study Course Edition! WEEK 1: LAW OF ATTRACTION 101. Desires, Our Vibrational Reality, What This Means For Us. WEEK 2: WHO WE REALLY ARE. Feeling Signatures, Introducing the 40-day Journey. WEEK 3: WHAT YOU REALLY WANT AND NEED. Identifying Resistance, Limiting Beliefs. WEEK 4: PRACTICAL APPLICATION. The Fool-Proof Manifestation Process, Ditto Work, Finding Purpose. WEEK 5: RESISTANCE STRATEGIES. Art of Allowing, Intro To Shadow Work & Parts Work. WEEK 6: YOUR NEW LIFE. Basking, Attitude of Appreciation, Deciding What Happens. WEEK 7: SURRENDER. Hidden Positive Intention Work, Right VS Wrong, Knowing What's Useful. WEEK 8: EMPOWERED. Recap, Final Q&A, End of Obligations. Because I am powerfully intending for huge transformation in this group, that is something that -will- occur and that can be scary. Know that this course is for those that are sick & tired of the struggle and are READY to do the work. I can teach you everything you need to know, but unfortunately I can't do the work for you, so this course is only for you if you are open and willing to show up for YOU! And I will be there with you every step of the way! I know that this is always the scary part, right? I remember when I enrolled in my first course with a coach, and when I took the plunge, I was like--WHAT did I just do? By making the decision to invest in myself in a big way, I made myself available to receive in a big way. I began to shift so much of my own mindset and beliefs to where I made more money than the $1800 investment in less than 2 weeks and paid it off on the credit card I took it out on! I shifted from desire, of wanting it, to decision, now I HAVE to pay attention & learn this so I can be okay again financially! The investment is necessary because it causes you to become serious about change and maximizing your experience, which makes the whole thing work!! And it lasts! We make it sustainable. I am holding the space for you where if this is something you WANT, that you will find a way to decide that it's going to HAPPEN! Any fears or lack mentality coming up in this moment is your indication that you are READY to move through it once & for all. Money can be EASY and SUSTAINABLE! You're Ready. 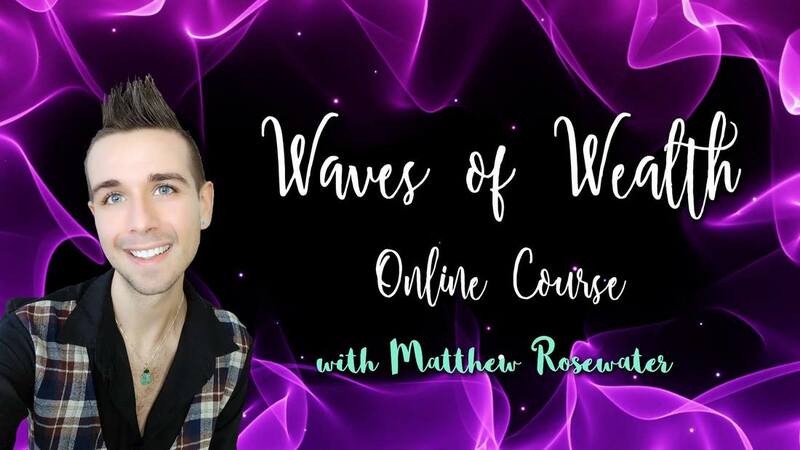 By the end of this course, not only will you be prepared to call in abundance, but you will leave with the capability to quite literally manifest ANYTHING! Let's do this. I get it. Let me show you how! Common Question: Do I Need To Attend Each Weekly Module Live? Answer: Nope! Each module is already dropped in the private FB group! This particular launch of the course is an independent home-study where you work through the material at your own pace, and you'll have forever access to it! It's designed to work on 1 Module per week over 8 weeks, but you get to choose how quickly you want to work it. Common Question: How Do Payment Plans Work? Answer: Yay for payment plans! I know how helpful these are. Each installment is paid automatically on a monthly basis. For example: You'd pay the first payment of $111 now, which gets you access, and then in 30 days, the next payment will be processed until all 3 are paid over a 3-month period. Common Question: What is guaranteed and are there refunds? Common Question: What level of support comes with this home-study course? Answer: Group support! You are welcome to utilize the group of other students/alumni! I may pop into the group from time to time to see if I can answer questions, but is not an included piece with the course. Feel free to check out my 1:1 coaching/healing services if you would like to include an extra layer of support during your journey! Common Question: What is each Module like and how does that look? Answer: Modules are pre-recorded video trainings that may also include a presentation of slides. Each Module comes with the video training (most average 60 minutes) as well as a Workbook to go along with each module that contains the homework. Also, there is an audio recording for each module should you choose to want to listen to the material as an option too, such as while in the car or having on in the background while doing other things.